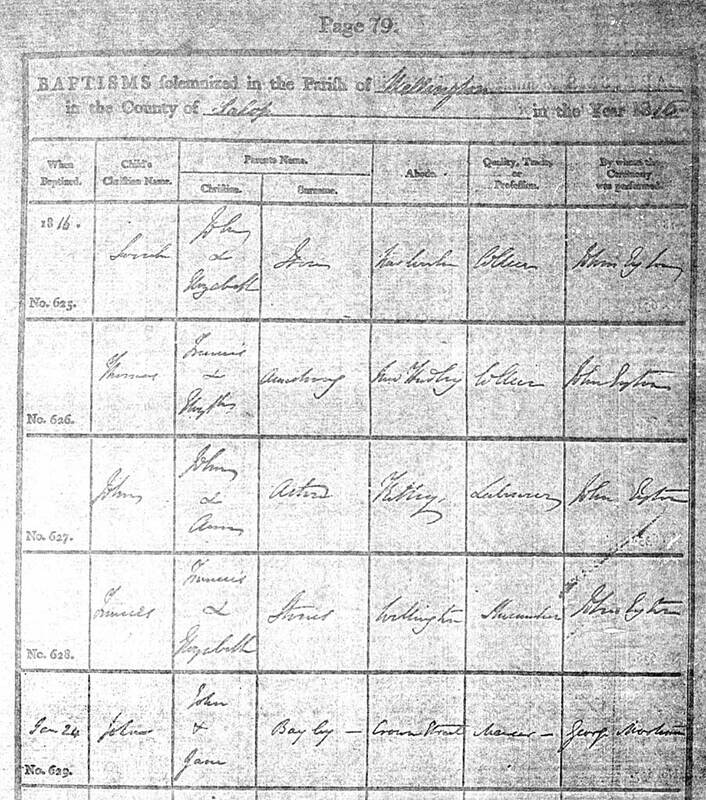 John Horatio Robert Bayley was baptized 24 January 1816 in Wellington, Shropshire, son of John and Jane Bayley. John Sr. was a mercer, or merchant, usually one dealing in cloth, and the family was living on Crown Street at the time of the baptism. John and Jane, his parents, had married in February 1812. We don't know when John Jr. was born, but he was baptized in 1816, four years after his parents married. His parents moved often and there may have been a child born before John Jr. but so far none has been found. Four children were born after John Jr.: George, Ann, Enoch and Samuel. John Jr. married Margaret Morris of Blymhill in 1835. Source: Parish Registers, All Saints Church, Wellington, Shropshire, England, p.79, record #629. FHL MF 2355579.